When the discussion of a low-sugar diet comes up, most people think that is something that only concerns people with diabetes. The reality is that everyone should be concerned regarding the amount of sugar that is included in their daily diet because of issues like diabetes, obesity, tooth decay and other problems. However, virtually everything contains sugar. The good news there is often a substitute product that contains much less sugar that can be used. 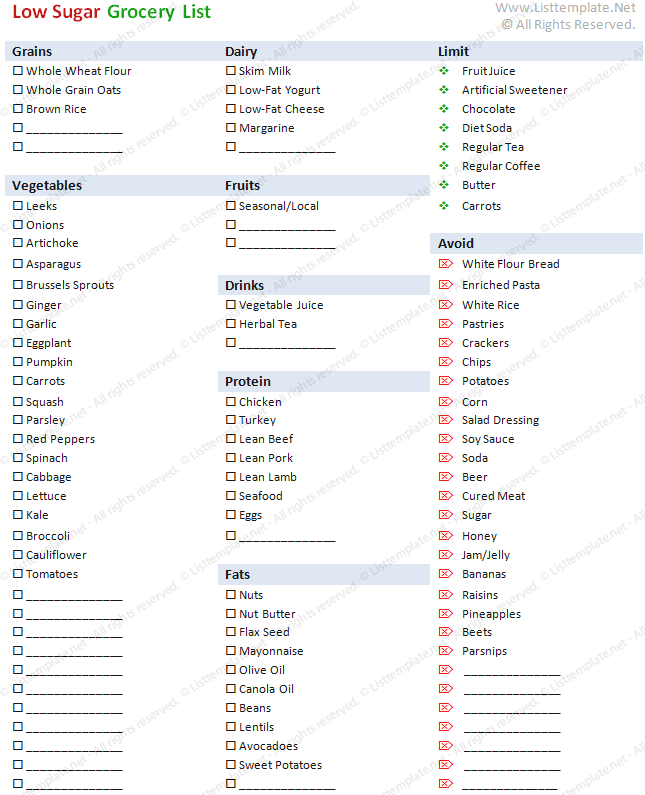 The Health Grocery List template, built on the Microsoft Word® platform, helps you to make good choices. The Grocery List template can be used when shopping or preparing the grocery list. It shows the foods, by categories, which have lower sugar content. It also provides a category of items to avoid because they may contain an excessive amount of sugar. There are many low-sugar products on the market today that do not have the aftertaste that is found in other products. In fact, there is a very tasty brand of ice cream that is sugar free. The grocery list template is a guide you can follow as you travel down each aisle of the grocery store and while looking for these products, it also provides an opportunity to examine old favorites and new products to determine if the sugar content is within an acceptable level.